The wheels on this page are for the popular chop saws like the picture at right. The specifications on this page are aluminum oxide designed to cut ferrous and some nonferrous metals. Email or call for other specifications. Do not use these blades on belt driven saws. 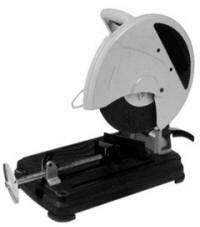 Use with direct drive table mounted saws. General purpose internal reinforced for smooth cutting (similar to the Makita type wheels). Excellent for precision work.